I am making assumptions rather than reporting in this sentence; the appearance of the Legacy line strikes me as a reaction by Sheaffer’s designers to the rather slim and cylindrical designs of the 1980s (which you may examine on one page of my mug book). It was essentially a ressurection of the PFM in general outline, with references to ’50s styling in the advertising, but with a somewhat different filling system. The degree of “somewhat” depends slightly on the precise age of the pen, as there are three generations of Legacy. The Legacy 1 follows the pattern of the PFM most closely, but has an oddly schizoid filling system. In the earlier Imperial models, one could get either a Touchdown or a cartridge version; the Legacy 1 was both. The barrel included the tubes and seals necessary for the Touchdown system, but instead of a fixed sac the pen has a special converter (although a more pedestrian squeeze converter will work) that can be dismounted and replaced with a cartridge. The same internal set-up was found in the Legacy 2, which differs from the previous version in that it loses the square cross-section tail and cap-top that were imported from the PFM. It also replaced the PFM-style cap-grabbing trio of studs with a clutch-ring similar to the Targa’s. The current version, the Legacy Heritage, has done away with the Touchdown option for filling, and thus has no blind cap and a seamless tail. In addition to the usual horde of sub-types that Sheaffer offers for its lines, although without the sub-model names that make cataloguing 1938 through 1970 such a challenge, there are a wide variety of Limited and Special Editions offered by Sheaffer or third parties who rework pens supplied by the company. I am in most respects positive towards the Legacy, although when I got mine the tines were slightly out of alignment; it being a “new old stock”, this slight problem may have developed post-factory and I don’t want to blame recklessly. I have two very small complaints about it, one of which is merely prospective. The actual complaint is my usual one about the unnecessary heaviness of many modern pens. While the amount of hardware in the two convertible types of Legacy put a limit on how light it may be, it’s still heavy. Happily, the dimensions of the thing are such that the weight is well distributed and balanced, so a long writing session is not a great penance. The prospective complaint lies in tail of the pen. While the parts of the Touchdown rig are all present and familiar, the way they are held together are not. The simple screw that held blind cap to filler tube is gone, replaced with some sort of plastic complication. If, or rather when, the o-ring fails, a highly specialized tool will be needed to replace the very simple bit of rubber, and there’s a very good chance that by that time Sheaffer will have declared the mechanism obsolete and either offer an “equivalent model” (lacking the sentimental value of the pen one’s been using for 25 years) or a bland suggestion that it still takes cartridges. I am, of course, inventing things to be cranky about, but it seems in line with the current way of handling consumers. 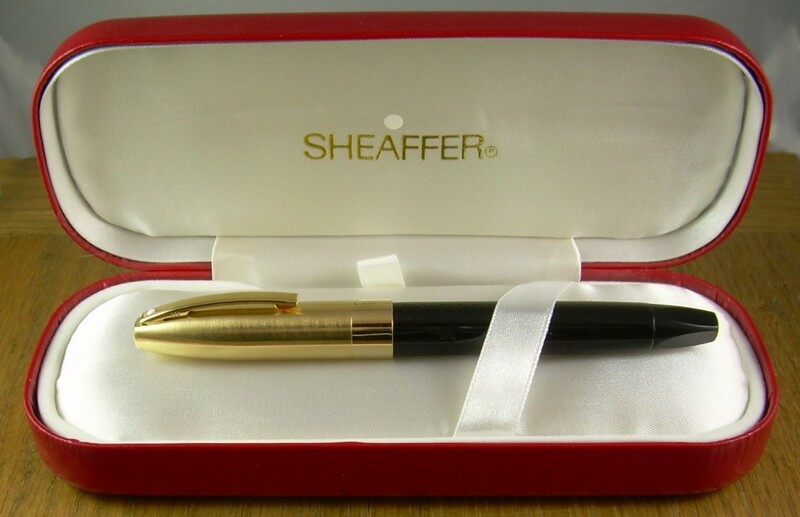 Update: With Cross’s purchase of Sheaffer, the Legacy has been discontinued, evidently to avoid internal competition. Production Run: Legacy 1, 1995 – 1998; Legacy 2, 1998 – 2002; Legacy Heritage, 2003 – c. 2018. Cost When New: Currently about $350 to $650 for non-limited editions, depending on finish. Size: 13.9 cm long capped, 15.5 cm posted, 12.7 cm uncapped. Body: Metal with various finishes. Filler: Touchdown converter, capacity approx. 0.8 ml, in some models; all accept cartridges, approx. 1.1ml. This is what we might think of as “field stripped”. The converter has a single hole at the end to allow the for compression of the sac it contains. Converters of this sort with a red fore-end contain a synthetic and theoretically long-lived sac, while others contain rubber.